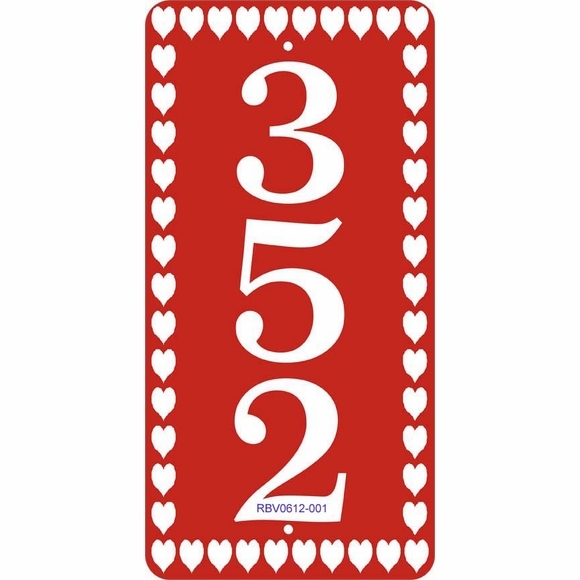 Personalized Vertical Address Sign with Heart Border - - 6" x 12" vertical plaque perfect for tall, narrower spaces. Holds three large 3" characters. Made in USA. In addition to the heart border, this sign features slightly rounded radius corners. Note: The style number you see near the bottom of the sample will not be on your plaque. Dimensions: 6"W x 12"H x 1/8". Personalized address sign crafted in the USA by skilled artisans to assure the highest quality.